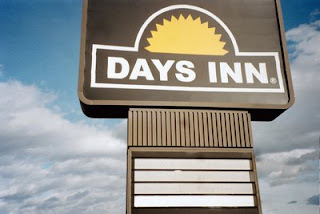 Any one remember this location for the 2002 October Workshop? Remember the speaker? 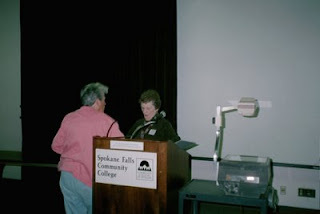 Speaker Dani Lee McGowan and program director Marvelene Carney talk at the 2001 conference at Spokane Falls Community College. 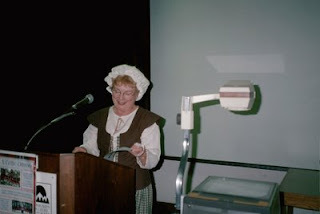 Rosemary Braun dressed for her presentation at the 2001 conference at Spokane Falls Community College. Recently, EWGS librarian Juanita McBride announced a new addition to the collection of the genealogical holdings. Italians of the American Northwest, by Charley Vingo, is a 793-page, illustrated volume published in 2001 by a Spokane author. It is available in both the Genealogy Room (3rd floor) and Northwest Room (2nd floor) of the Downtown Branch of the Spokane Public Library, and is cataloged under call numbers GEN 973.0451 ITALIAN and NW 973.0451 ITALIAN, respectively. As a reference book, it cannot be checked out. If you have Italian ancestry in the Northwest, you will want to consult this volume. For those out of town, you may wish to call the information desk at (509) 444-5300 to have a librarian do a lookup for a surname for you, or e-mail EWGS's researcher Charles Hansen. Donna Potter Phillips will be offering four classes this spring as part of the Spokane's Senior Program. Each class is on a Friday from 10:00 AM to 12:00 PM at CenterPlace at Mirabeau, and costs $9.00. Register at 533-8010. Classes will be canceled if there are not enough registered. Class #M216 - March 27 - Where is the Book with My Family in It? Irrigation gave life to Spokane Valley, and now the Spokane Valley Heritage Museum is giving new life to the area’s farming history with a special exhibit on irrigation. If your family farmed the Spokane Valley, or your childhood memories involve visiting the Valley farms to harvest their delicious fruits and vegetables, or if you just love local history, you'll want to visit the Spokane Valley Heritage Museum's "Water is the Story" exhibit. More details and photographs here. The EWGS "LUG" (Legacy Users Group) had their first meeting on Wednesday, March 11, at the Shadle Library. Everyone was asked to bring their specific questions on a 3x5 card and at meeting's end, most questions were answered after some good discussions. Donna Potter Phillips assumed the roll of moderator for this first meeting but ALL will be taking that position and teaching one another. Millennium Corp offers two sets of training CDs and the group authorized their purchase and will divide up the $54 cost among the "LUGgers." Next meeting will be the third Wednesday, April 15th, 1:30 to 3:30, at the Shadle Library. All who use or want to use the Legacy genealogy program are invited to attend. The happy committee of EWGS members working to ensure a successful Washington State Genealogical Conference (11-13 Sep 2009) had their umpteenth meeting on Friday, March 13, and report that all is going splendidly and everything is on track for a successful conference. The principal speaker is Megan Smolenyak Smolenyak and the 16 mini-sessions are all in place. Details are on our EWGS website and will be soon on the WSGS website too. Hope all who read this are saving their pennies and plan to attend!! Remember the WSGS motto: "You won't know if you don't go!" If you are a RootsMagic user, or are simply curious about this genealogy software program, you may be interested in the RootsMagic Users Group, which meets at 7 PM on the third Thursday of each month at the LDS Church at 808 E. Sitka (this month's meeting is on March 19th). Lew and Trudy Lundy lead this group. For more information, e-mail them here. 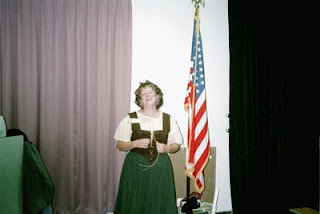 Melissa Siegel one of the speakers at the 2001 Conference at Spokane Falls Community College. She was dressed in costume for her talk. Want to see her bloomers?? 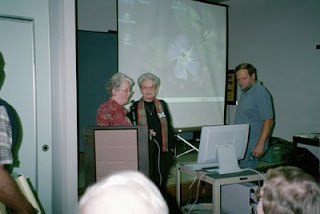 If you are a Legacy Family Tree genealogy software user, or are simply curious about this genealogy software program, you may be interested in the Legacy Users Group (LUG), which will meet next Wednesday, March 17th, from 1:30 to 3:30 PM in the meeting room of the Shadle Park Branch of the Spokane Public Library at 2111 W. Wellesley. Regular attendees will take turns in the role of moderator for each meeting. If you have more questions, please contact Donna Potter Phillips here. New York, March 5, 2009 – Family network dynastree just launched the Canadian version of its famous Surname Maps. The free tool that shows the surname distribution of more than 600,000 Canadian last names is the perfect companion for surname research. http://www.dynastree.ca. The distribution among the provinces is shown in a coloured map, the user can choose from relative or absolute distribution. With the help of dynastree’s tool, the origin of surnames can be researched quickly and easily. Dynastree is a fast-growing family network to build a family tree. Once the family tree is started, relatives can be invited directly to add knowledge and help to extend its reach. Together, family members can enter information on other relatives and ancestors. The communication with relatives and friends can be established and carried on even if the connection had been lost or if they live far away. (www.verwant.nl), Italy (www.parentistretti.it), Russia (www.semyaonline.ru) and France (www.familleunie.fr). The platform will continue expanding to other European countries as well as worldwide. Dynastree is supported by leading Business Angels, Hasso Plattner Ventures and Neuhaus Partners, a well-known venture capitalist. Recently, Family Tree Magazine ranked Washington State the Number Two state for online resources in its May 2009 issue (already mailed to subscribers; coming soon to a newsstand near you). Today, I read an article in the March/April 2009 issue of Ancestry magazine online, titled "The Wired States of America: A Look at Digital Records Near You." On page 10 of this online article, Ancestry names Washington State as its Number One state for online resources, thanks to the over 60 million searchable records in its state Digital Archives collection, the same reason that Family Tree Magazine gave us a thumbs up. Have you checked out the Washington State Digital Archives yet? This is from Geneamusing Blog by Randy Seaver. It's almost Saturday Night here in the West. Let's have a little fun before we go to bed or wherever in the morning. We must be Genealogy Junkies, right (after all, many of you come back every Saturday Night!). How about a True Confessions time, genealogy style? 2. Why did you start doing research? We had a family reunion of the Hansen family and my sister and I wanted to know more about our family. 4. What is your biggest genealogy regret? Sending my complete GEDCOM to the Edward Doty society, it ended up on the internet a few months later with all my living relatives listed. 5. What are you best known for in the genealogy world? Being the EWGS research expert. 6. What is your professional status in genealogy? Not certified or registered, but still have done a lot of local research, so probably know the local records pretty well. 7. What is your biggest genealogy achievement? Indexing records for the local and state libraries and the Digital Archives at Cheney. 10. What notable genealogist would you like to meet someday? Charles Morton Hansen When I first received the index for the articles in the NEHGS quarterlies, I found an author Charles M. Hansen of one of the articles, later found his middle name was Morton not Michael like my middle name. There you are - talk about yourself for a change! Go forth and blog about your True Confessions of a Genealogy Junkie! Or write a comment to this post.